You Can Do Awesome Things with a Baby in Your Lap! You in the ponytail and yoga pants: you are amazing. You who ate a bag of fruit snacks for breakfast because you were late for a work meeting: you are fabulous. You who can’t remember the last time you wore makeup: you are incredible. No, really, you are. God specifically chose amazing, fabulous, incredible you to be the mom of your beautiful child. Sometimes it’s hard to remember in the sleepless nights and chaotic days, but don’t forget it — you are a force to be reckoned with. A world-changer, equipped to make a difference in the lives of others. How we raise our kids has big implications for the world they will inherit. Teaching them to love people is no small task. To be completely honest, at this stage I am happy when my child is fed, happy and relatively clean at the end of the day. How do I even begin to instill in her a soft heart and teachable spirit when my daily battle centers around thrown food and a child who refuses to listen? My approach: One small moment at a time. One lesson at a time, one eye-opener at a time. The world really is bigger than who moved your LEGO. Some moms at Compassion International put our heads together to create easy ways for MOPS moms like you to teach your children about loving others. As a result, we developed a Family Activity Packwhich includes crafts, Bible lessons, recipes, coloring pages and other valuable tools to help you raise compassionate adults. It’s available in one easy download. 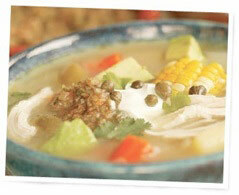 Here is a sneak-peek recipe to give you an idea of what we’ve put together. Doesn’t it sound perfect for a fall day? To get a taste of the bigger picture, check out this video. 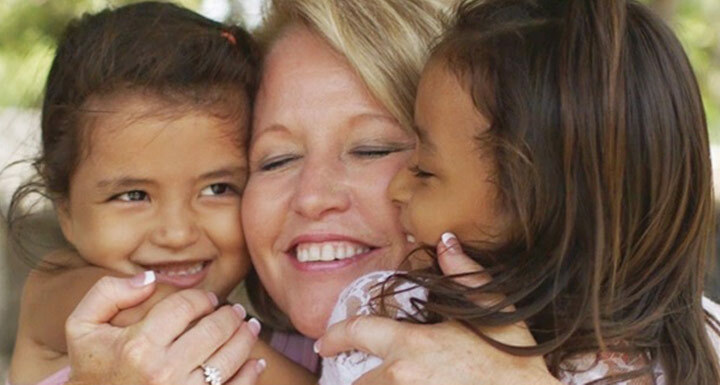 Watch and hear Sherry Surrat, MOPS CEO, tell about how she is helping to shape the hearts of two little girls she sponsors through Compassion. Sherry recently traveled to their village in El Salvador, where she saw firsthand the difficult conditions of moms and children and the impact that sponsorship has on their lives. As a mom who has great influence in the lives of her children, you have a unique opportunity. You are perfectly positioned to teach your children about the needs of people across the world and to raise them to be world-changers in the fight against extreme poverty. Sponsorship is a great way to model God’s love, generosity, and care. Truly, you can help with a baby on your lap! You can sponsor a child, right now, right here, in five minutes or less, forever changing his or her story, and the story of an entire family for generations to come – for a little more than a dollar a day. Remember, you are amazing, fabulous, and incredible and He chose you to be the one your little one calls momma. The no-makeup, happy to have a shower Y-O-U! You are beautifully and wonderfully made and are equipped to raise compassionate adults. We’re here to help!